Cardiomyocytes (heart muscle cells) derived from human stem cells are alive and in co-culture with human endothelial cells (cells that form small capillairies or blood vessels). The co-culture is 14 days old. 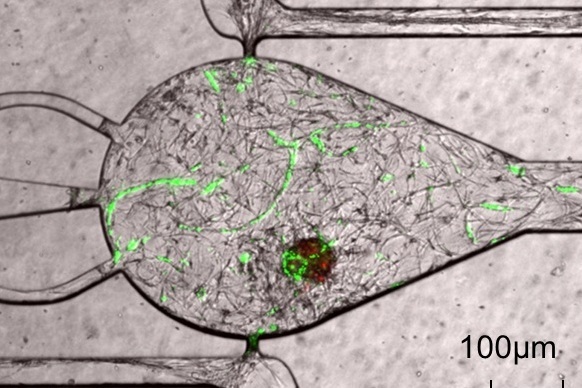 The central microtissue, which contains the cardiomyocytes (red) and vascular networks (green), is nourished by two media-filled channels. “We will be developing microtissues that mimic cardiac and cancer tissue, and these microtissues will be receiving nutrients like oxygen through real human blood vessels,” said George. “We believe reproducing this complexity is necessary to mimic more closely the human response to new drugs. We chose cancer tissue and cardiac tissue to simulate together because cardiac side effects are a common reason that new anti-cancer drugs fail in pre-clinical and clinical trials." George is one of a team of eight investigators that is highly interdisciplinary and includes expertise in tissue engineering (George), blood vessel growth (Professor Christopher C. Hughes, Ph.D., Department of Molecular Biology and Biochemistry), tumor biology (Professor Marian L. Waterman, Ph.D., Department of Molecular Biology and Biochemistry), microfabrication/microfluidics (William J. link Professor & Chair Abraham P. Lee, Ph.D., Department of Biomedical Engineering), fluorescent imaging (Professor Enrico Gratton, Ph.D., Department of Biomedical Engineering), stem cell biology (Assistant Professor Leslie F. Lock, Ph.D., Department of Developmental & Cell Biology and Department of Biological Chemistry), cardiac extracellular matrix (Assistant Professor Karen L. Christman, Ph.D., Department of Bioengineering at UC San Diego) and heart cells (Bruce R. Conklin, Gladstone Institute of Cardiovascular Disease). Once they are developed, these tissue chips will be tested with compounds known to be safe or toxic in humans to help identify the most reliable drug safety signals — ultimately advancing research to help predict the safety of potential drugs in a faster, more cost-effective way. The initiative marks the first interagency collaboration launched by the NIH’s recently created National Center for Advancing Translational Sciences (NCATS). Tissue chips merge techniques from the computer industry with modern tissue engineering by combing miniature models of living organ tissues on a transparent microchip. Ranging in size from a quarter to a house key, the chips are lined with living cells and contain features designed to replicate the complex biological functions of specific organs. NIH’s newly funded Tissue Chip for Drug Screening initiative is the result of collaborations that focus the resources and ingenuity of the NIH, Defense Advanced Research Projects Agency (DARPA) and U.S. Food and Drug Administration. NIH’s Common Fund and National Institute of Neurological Disorders and Stroke led the trans-NIH efforts to establish the program. The NIH plans to commit up to $70 million over five years for the program. To learn more about the Tissue Chip for Drug Screening program, visit ncats.nih.gov/tissue-chip.html.